What happens when you discover you aren't who you thought you were? And that the person you love is the person who will betray you? If your fate is already determined, can you fight it? If you read and loved Hunting Lila by Sarah Alderson, then you should be prepared to know that this book is nothing like it. I am not saying it isn't fabulous, I am just saying it is completely different. This book is full of fast action, edge of your seat moments, involving Hunters whose sole destiny is to destroy Unhumans. Think how Stephanie Meyer wrote Host which is in a completely different vein to the Twilight books and you will understand what I mean. Luckily I had been prepared for a different kind of story and was more than happy to ride this thrilling rollercoaster. From the first chapter, you are hooked as Evie captures your interest. She is a sassy, smart girl who has a real toughness about her. Considering everything that is thrown at her, she deals with it brilliantly. She jumps from being a normal everyday girl like the rest of us, to becoming the one who could end the war. That is a tough deal for anyone to live with. However, she is quick to come to terms with her destiny and makes a shocking decision affecting everyone's future. This is definitely a situation of opposites attract as there is no way that Lucas and Evie should be together. He is sent to kill her and she is destined to kill him, yet they end up falling in love! If I was Evie, I would still be a bit weary of him in the future. I am rather in awe of Sarah Anderson's writing talent. I am still amazed that she managed to come from nowhere and write six books in two years. She really does blow me away and I seem to come away so inspired by her writing. Also her talent for writing is obvious as soon as you begin reading one of her books - I never feel like I am reading a debut author. She is very detailed in her description and picks up on the little human nuances we all have giving her characters an extra air of reality. The writing is fast paced and the action well timed, proving that Sarah knows how to write an action scene. I found the plot to be excellent and very convincing and I was surprised by some of the events that occurred. This book also hit a personal note with me. One of the characters in the book is a dog called Lobo. I had to find out where the character name had come from as Sarah had mentioned in the back of the book that she had borrowed his name. Sarah told me that he was the only real character in the book. It instantly took me back to my honeymoon in Mexico where I met the local beach dog - Lobo! It is such an unusual name, that it would have been amazing if it had been the same dog! I had one little niggle with the book and I know it is daft. I didn't like vampires being called Thirsters. I don't know why, it just didn't sit with me at all. I am probably just too fussy. If you are looking for a fast paced thriller where opposites really do attract, then this book might be for you. I thought it was brilliant, I didn't love it as much as I love Hunting Lila, but I did really enjoy it. However this obsession with Hunting Lila may just have something to do with the swoonsome Alex! Sarah Alderson has definitely earned her spot in the YA author map. 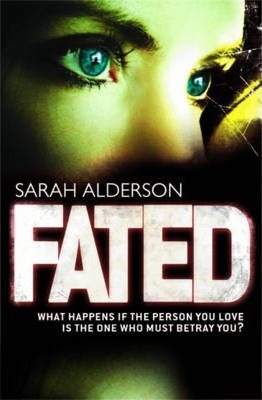 Pop back to the blog at 3pm to read my interview with Sarah Alderson. District YA - it is different but definitely good. Book Angel Emma - I wish you had said that before I lent it out. Ooh this sounds like a really good read. Blodeuedd - it isn't like The Host, just showing how an author change direction from one way of writing to another. Jenni - It definitely was. This does sound really good. Thanks for the recommendation. I like the comparison to Twilight and the Host, I have an idea as to what you mean. Great review Viv, can't wait to get my hands on this book!